by Patrick DeWitt. Ecco, Harper/Collins, New York. 2011. 328 pp. ISBN: 978-0-06-204126-5. 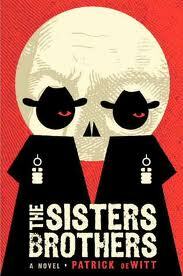 I read THE SISTERS BROTHERS by Patrick DeWitt expecting a literary treat: Here’s one of six 2011 novels short-listed for the Man Booker Prize to be awarded in a few weeks in London. Moreover, DeWitt now lives in my hometown of Portland, Oregon (although it’s birth in Canada qualifying him as a Booker nominee). Two Sisters brothers, Charlie and Eli, set off from Oregon City in 1851 with a contract to kill one Hermann Kermit Warm last seen in San Francisco. We quickly sense older Charlie is a hard-drinking psychopath and younger Eli, at best, a codependent sidekick. Before reading much more, I realized every character has the same stilted speech. Authorial voice? Does DeWitt’s gifted ventriloquism deny his characters their own voice? That and stock situations from the Western genre—the public duel with the steely gunfighter, the prostitute with a heart of gold, the pioneer child orphaned, abandoned in the wilderness are here—but with jokey twists. If I kept reading, it was to see how DeWitt would extricate the Sisters brothers’ cartoony souls from a moral landscape that was too nuance-free, too B & W for my taste. They arrive in San Francisco and at once realize everybody is making money—and lots of it—in ways that involve more than the wrong livelihood of contract murder. Surprise, Eli has doubts about his line of work. The novel does resolve, but first DeWitt indulges us with a few dumps of backstory. We learn how Charlie came to be such a twisted Sisters brother: Oedipal urges! Possibly some readers buy it: What less than patricide would set off a killing spree that could only be stopped by stumping a gun hand? Predictably, at story’s end, the two Sisters brothers rejoin their mom in Oedipal comforts back in Oregon City. Eli Sister imagines he might live differently and thinks of opening a trading post. This reader was underwhelmed. Still, I can say I’ve read one 2011 Man Booker nominee. Once. Contributor Charlie Dickinson writes from Portland, Oregon, USA. His blog is at http://www.cosmicplodding.net.